The Greater Toronto Area property market continued its stellar performance since July. 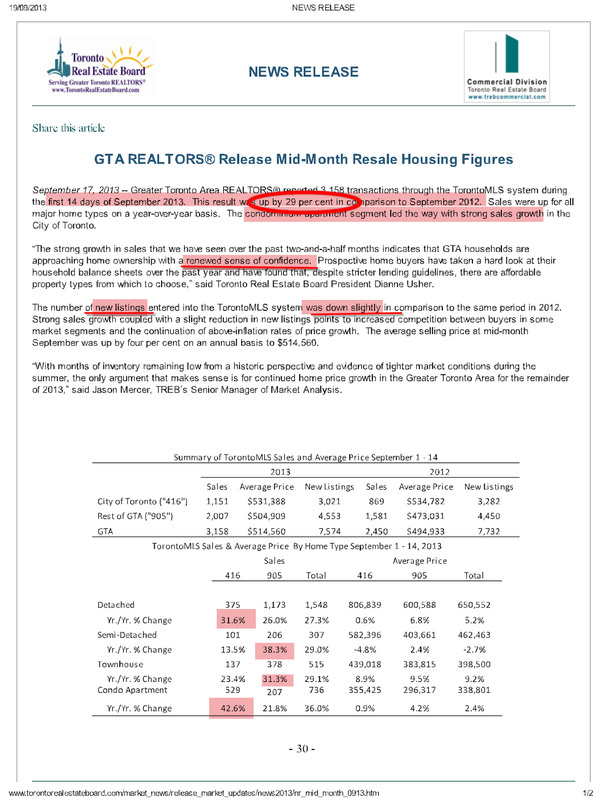 Based on TREB mid-September numbers, the first 2 weeks recorded 29% more resales than the same fourteen days of 2012. From the field, the activity level is comparable to this "Hot Summer", both in terms of buying and selling homes. Here is our listing ad for this cycle. 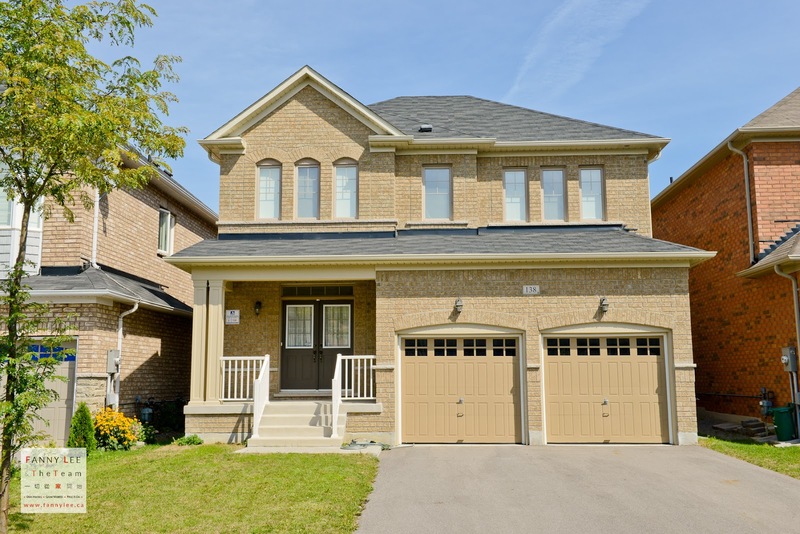 • The convenient and contemporary 20 Wahba Way in Middlefield, Markham was sold. • 71 Murison Drive, Cathedraltown is coming to the market. It is one of those few Cathedraltown detached homes with house front garage access. If you are interested in any of these featured listings, email or connect with us on Facebook, Twitter, Instagram or Google+. Or if you are considering to list your property, call us to find out how we could help. * SOLD * If you have been following us here or Facebook for the last few months, Whitchurch-Stouffville needs little introduction. 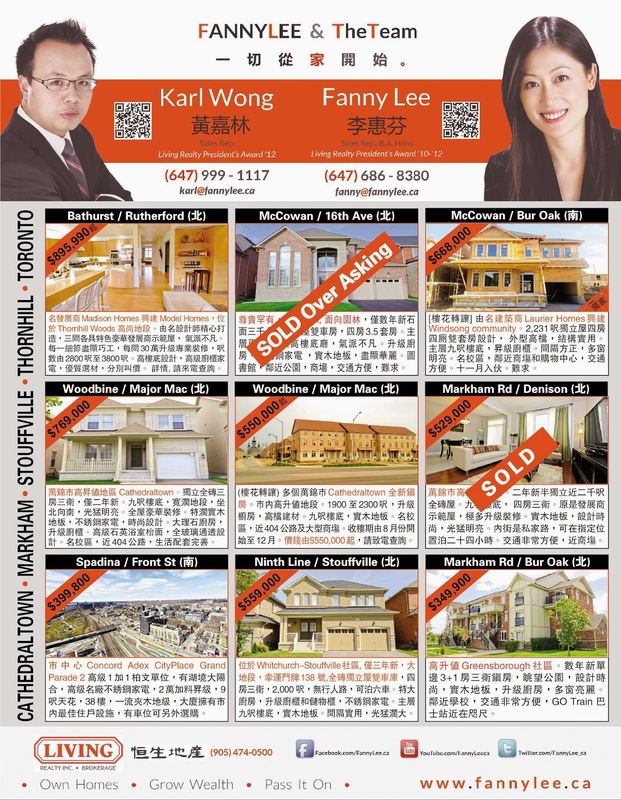 Stouffville with its picturesque setting, quality new homes, GO Train access, rapidly developing infrastructure has been a new haven for young families (refer to "生活在 Stouffville 大自然" article for more). 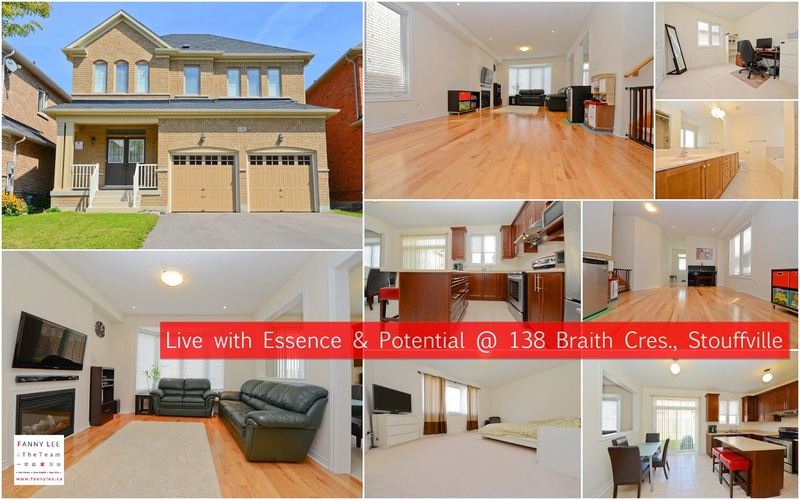 If you are searching for a detached in this vibrant community, 138 Braith Cres may be the home you have been waiting for. This 3 year new detached has 4 bedroom, parking space for 6 cars and numerous upgrades (contact us for details). 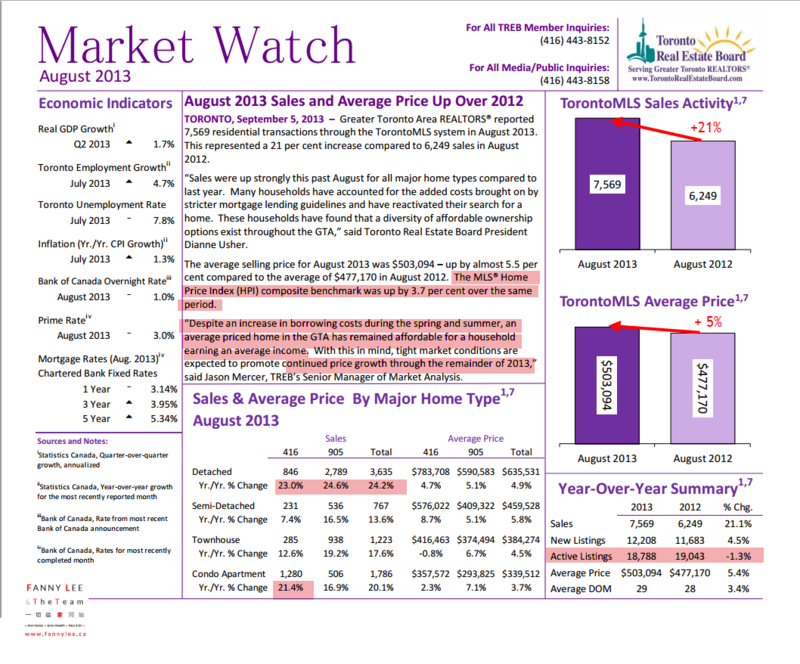 Following July's trend, TREB reported "Sales and Average Price Up Over 2012". "Many households have accounted for the added costs brought on by stricter mortgage lending guidelines and have reactivated their search for a home," said TREB President Dianne Usher. • active listings dropped slightly. - Ming Pao Property Goldpage cover story where I was interviewed. Greater Toronto Area property market scored the 3rd best July. Since June 2012, the monthly resale number has been lower than 12 month before until July 2013. 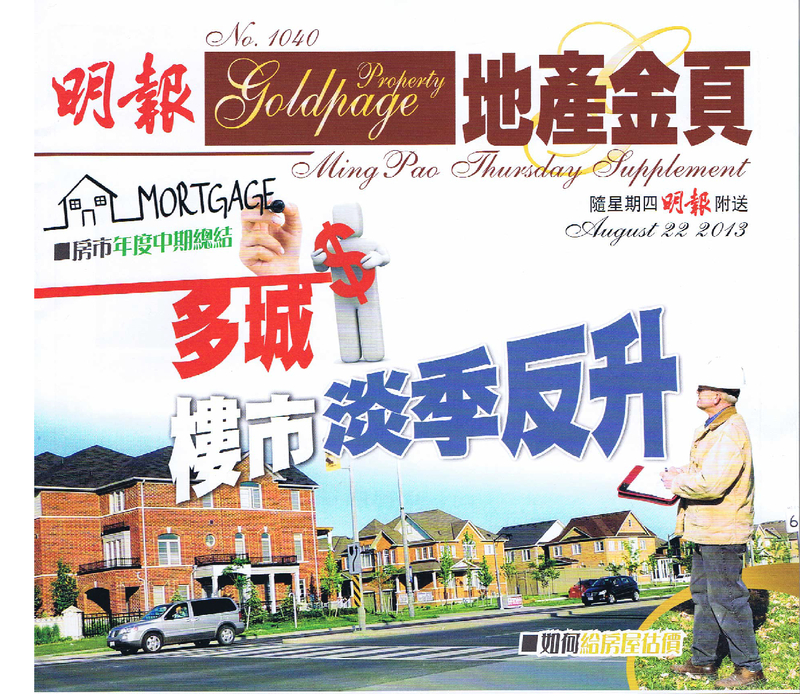 Ming Pao (明報) Property Goldpage (地產金頁) had a cover story : [多城樓市 淡季反升], vaguely translated to "Toronto Property Market - Hot This Summer". The article provided background and input and real example from myself and a fellow realtor. Without further ado, here is the scanned image of the August 22 piece.